Frozen bananas, you make me happy. I love a frozen banana thrown into a chocolate or vanilla + peanut butter milkshake. And they make all the difference in smoothies (if you are using room temperature bananas in your smoothies, stop right now and try a frozen one!). I find that if I use frozen fruits in smoothies I can omit the ice and they are way tastier. Little man was on a smoothie kick for awhile, so I was freezing bananas like a mad woman. Just slice and place into a plastic baggie (I add the date so I know which ones to use first). Have some very ripe bananas that you don't know what to do with? Freeze them! The very ripe ones are even better in smoothies! 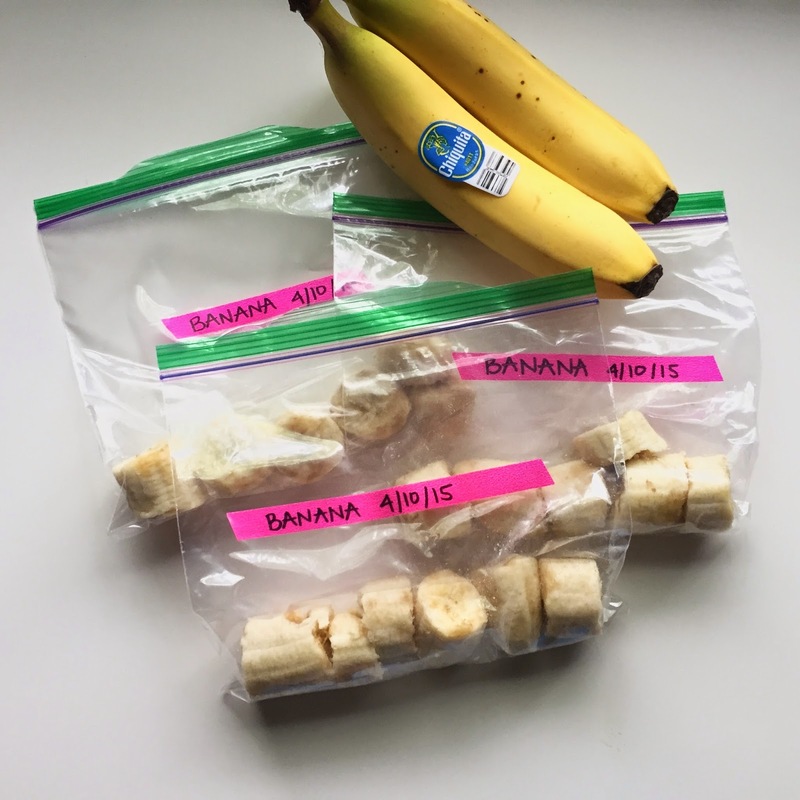 Since Parker loves helping in the kitchen, I started putting just one banana in each bag instead of filling them up (this way I could pull out one bag and he could place all the pieces in the blender). Frozen bananas - a must to try! Tulips, you are adorable. 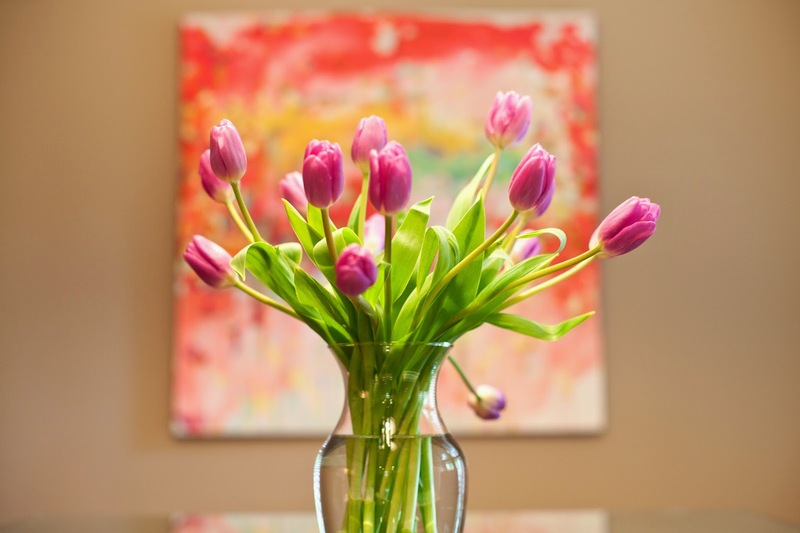 And you scream "spring" :) I mean, is there anything more happy than tulips on the table? They so make me smile. Essie nail polish, you are my favorite. And Luxe Effects by Essie is just pure sparkly goodness. Trust me, you need the gold color on your nails, stat. Finally, vintage Starbucks gift card, I knew there was a reason I carried you in my wallet for so many years. The card carried a balance of $0.05 but it was so cute I couldn't throw it away. Then just last week, I got the crazy idea of trying to add the card to my Starbucks iPhone app. I didn't think it would work since the card was so old, but lo and behold, I entered the information and it popped right up on my phone! I quickly reloaded it so I can use it whenever I use the app. I just love seeing the former (now vintage!) logo. Smile, it's Tuesday (which is almost Wednesday, which is practically Thursday, which is pretty much already the weekend). We love using frozen bananas in smoothies...but sometimes I forget and we just have to use the overripe ones on the counter. Definitely not the same! I need that essie polish!! FUN!! It's a pain to get off but it's worth it!